It’s a new year; it’s a fresh start. As millions of American students head (somewhat grudgingly) back to school after the winter break, teachers are faced with the unique challenge of redefining the classroom community after weeks apart. In my secondary classes, January is perhaps even more important than August in terms of developing classroom community. The year is no longer full of mystery and promise. Students have largely made up their minds about me, and I have fairly well-developed notions about them. Social circles are established. Classroom procedures are in place. What, then, is left to do? A heart-to-heart. I teach juniors, and I firmly believe that junior year is the most difficult year of high school. My students are in the critical year of growing up. They are about to make the most important decisions of their lives so far, but they are just distanced enough to feel out of control. Grades, families, jobs, sports, and other commitments have them entirely overwhelmed. This is not a new story. In my high school, at least one junior committed suicide every year (thankfully, the school has taken vital steps to end the trend). When I was a senior, the junior who died was one of my closest school friends. Now, I share the story of my friend with my students each year. I validate the stress they’re under and remind them that grades and time management are not worth their lives. More than anything, I just want to let them know that I care, and I’m here for them. Every year, I get notes from students that this talk was what helped them seek help for mental health struggles, and more than once, I’ve been approached by a student who needed (and got) immediate help. I’ve started to believe that this talk is the most important thing I do for my students all year. An informal check-in. I give my students three quick questions and ask them to respond as a warm-up (sometime during the first week back). I read them and use the responses to guide the groups I make and any accommodations/modifications I make. I don’t beat myself up over the results if they’re negative–I still have a semester to really reach every student. If yes, what support do you need to be successful? If no, what are you finding too easy or slow? A new classroom routine. It’s a new year! I like to bring some energy to the classroom by introducing a new classroom routine. This year, I’m going to start using Brain Breaks on a regular basis. Get organized. I like to take time at the beginning of the semester to project the school calendar and talk about interruptions like breaks, testing schedules, and end-of-year activities. This semester always flies by, so I want to make sure students are prepared to keep pace. This is a great time to talk to my AP students about a study schedule, as well as out-of-class commitments like mock exams. If I’m really on it, I will give them a calendar with due dates mapped out for the quarter. 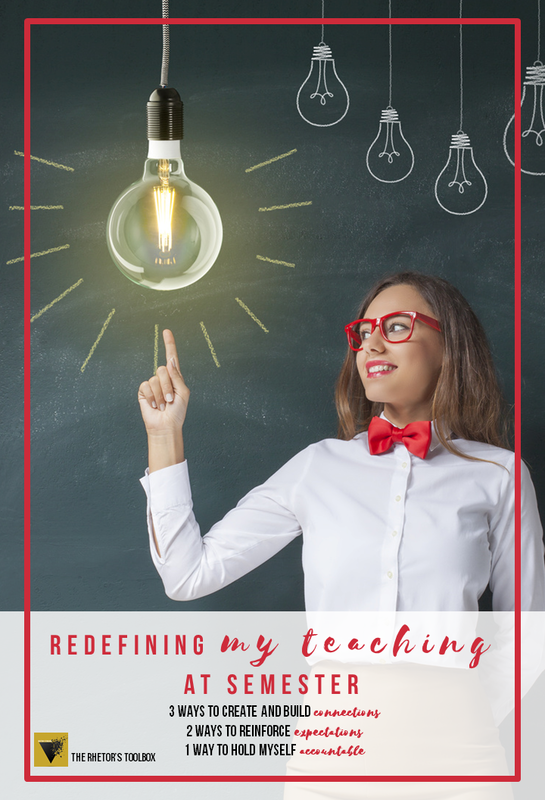 Ask the scary question: How am I doing as a teacher? I ask this of many different parties. I start with myself and reflect on what I think is working and not working. I check in with students in each of my classes who will give me a fair and honest response. I ask my school’s teaching partner to observe me and give me feedback. I invite my evaluator into my room for an informal observation. I also look at the teacher standards and consider whether there are any things I have neglected or avoided. Some years, I find myself putting in some extra work to improve my teaching. Other years, I find myself documenting what’s working well so that I can keep doing it in the future. Whatever the results, I talk to my students about what I figure out, and I share with them my plans to improve. They do a better job than anyone else of holding me accountable! I like the thought of breaking the year down by Aristotle’s appeals. If you have a post that describes how you think through your year according to the three appeals, reply with the link. I would love to read it! Where does Logos fit in?